An extraordinary video released by the Indigenous Council of Roraima (CIR) and Survival International shows the moment hired gunmen attack a Makuxi Indian village in Brazil. Although the Makuxi live in an officially recognised reserve, several powerful farmers are illegally occupying the territory and refusing to move. Gunmen hired by these farmers regularly attack the Indians. The state government has petitioned Brazil’s Supreme Court asking it to let these farmers remain on Indian land. It is expected to rule within the next month. Warning: this video contains images of violence and injuries which some may find disturbing. The video shows gunmen firing assault rifles and throwing homemade bombs at an unarmed group of Makuxi. The gunmen are believed to be working for Paulo César Quartiero, who is also the mayor of a nearby town. 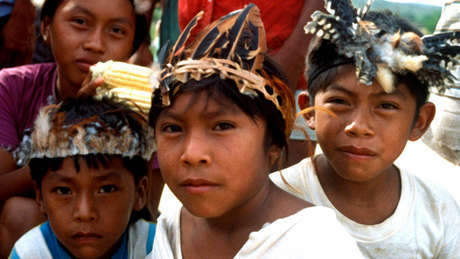 Ten Makuxi were wounded in the attack, six of them children. Mr Quartiero was arrested but has since been released. Police found a large cache of arms on his farm. The video was taken by CIR. Two Indians from the area, Jacir José de Souza, the founder of CIR, and Pierlangela Nascimento da Cunha, will be in London next week and are available for interview.